Waking up in Omaha this morning, the temperature sat right at the temperature that lets you know the seasons have changed – 32 F, 0 C. But with temperatures all over the thermometer, busy schedules, work during the week, kids’ events and practices, how do you keep your house comfy and cozy while maintaining smart energy management to minimize your bill? 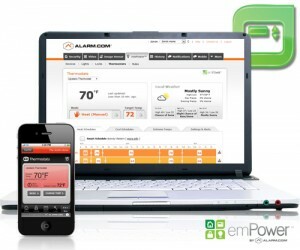 emPower® technology powered by Alarm.com makes it simple. With the highly-rated Alarm.com mobile app, you can turn down the thermostat before getting out of bed, turn it up on your way home from work, have it adjust when you arm your system or set a Smart Schedule to automatically adjust throughout the day to optimize your energy consumption. emPower allows you to maximize energy savings and home comfort. Smart Schedules provide a connection between your energy management tools and your security system powered by Alarm.com, allowing you to automatically adjust your lights and thermostats in addition to scheduling your lights to turn on or off based on alarm, arming, or sensor activity triggers. Apply energy management rules to turn off everything when you leave your home. An energy management system is much smarter when it’s connected to your security system. Using a home’s day to day activity patterns will help optimize energy saving schedules to actual usage. Activity Patterns are integrated with systems powered by Alarm.com so it’s able to uniquely leverage data from the security system about activity throughout the home. With this increased insight, you are empowered to schedule your heating and cooling systems to run more efficiently and save money. An energy management system is much smarter when it’s connected to your security system. Using a home’s day to day activity patterns will help optimize energy saving schedules to actual usage. Activity Patterns is integrated with Alarm.com’s security services platform so it’s able to uniquely leverage data from the security system about activity throughout the home. With this increased insight, users are empowered to schedule their heating and cooling systems to run more efficiently and save money. Additionally, with the Energy Monitoring utility you can stop wondering how to be energy efficient and get real insight into your energy use. View your energy usage in total, and by individual device, you’ll be able to see where you’re consuming the most energy and can make changes that have real impact. You’ll also be able to track the results of these changes on your energy use and costs so you’ll know if you’re making progress.